This interesting name is of locational origin from Humberstone in Lincolnshire or Humberstone in Leicestershire. The first mentioned, is believed to be named from a "great boundary blew stone" which marked the point where the Humber river discharged into the North Sea, that is, Humber plus the Old English pre 7th Century word "stan" meaning stone. The latter incorporates a personal name, "Humbeorht" deriving from the Germanaic "hun", a bear cub and "berht", bright or famous. "Hunbeorht" is the equivalent of Humbert and was very popular as a personal name in the Middle Ages. The surname had emerged in records by the end of the 12th Century (see below). 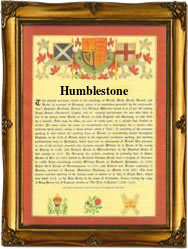 It occurs under variant forms as Humberston, Humblestone, Hammerstone etc.. One, Simon Humerstone married Anne Baylie on April 15th 1611, at "St. Gregory by St. Paul", London. Kathe, daughter of Thomas and Hanna Humberstone was christened at St. Giles, cripplegate on February 9th 1653. The first recorded spelling of the family name is shown to be that of Ralph de Humberstein, which was dated 1180, in the Pipe Rolls of Lincolnshire, during the reign of King Henry 11, known as "The Builder of Churches" 1154 - 1189. Surnames became necessary when governments introduced personal taxation. In England this was known as Poll Tax. Throughout the centuries, surnames in every country have continued to "develop" often leading to astonishing variants of the original spelling.